The Velvet Life - Page 72 of 130 - Musings of a Beauty Addict! Kopari Beauty is not new anymore and whoever I have talked to and has used their products, they are a fan. And personally, I am a big fan of coconut, I love eating coconut (both mature and soft jelly-like young coconut fruit), drinking coconut (coconut water is one of my all-time favorites), applying coconut oil on the skin and hair. This love started when I was little and in India, there was not a single time when my mom did not put coconut oil in my hair after washing and drying the hair, that was like a must-have and a part of the routine, as in most Indian households with kids. Even to moisturize the driest skin, coconut oil was always the answer. From north India, I went to South India where I could get fresh coconut juice and the fruit on every corner of the street. It was my best alternative to all the soft drinks and sometimes I could skip the water and drink it to freshen up. All these things aside, there are numerous benefits of coconut and its derivatives, so the main point here is coconut is a real favorite of mine and when there is a brand which is all about coconuts, then the love was obviously natural to happen. Kopari Beauty products have 100% pure organic coconut oil, sourced from the Philippines. The products do not contain sulfates, parabens, GMOs, and toxins. The right blend of pure ingredients with cutting-edge chemistry is used to enhance benefits of coconut oil. I have been using Kopari Coconut Crush Scrub and Kopari Coconut Melt since last month and they have become my favorites, they are keeping my dry flaky and hence itchy winter skin on the body at bay. Kopari Coconut Crush Scrub is described as a coconut oil-infused brown sugar scrub that polishes, exfoliates, and hydrates dry skin for a gorgeous glow. It is the best solution for dryness, dullness, uneven skin tone, and uneven texture. This is one-of-a-kind Coconut Crush Scrub is infused with a uniquely delicious blend of coconut oil, crushed Tahitian coconut shells, and brown sugar to hydrate and buff dry, dull skin for a silky smooth, lit-from-within glow. The complexion is left looking polished, restored, and radiant with a sweet, milky coconut scent to transport you to the tropics. I use it on my dry skin as an exfoliator before turning on the shower, then I massage it gently in circular motions to buff away the dry skin. Then I rinse with warm water and pat dry my skin. The results are soft, radiant, clear, and healthy skin. I follow with the body lotion or moisturizer of my choice or with Kopari Coconut Melt and I think the pair works very well together. Kopari Coconut Melt is described as a premium, multitasking organic coconut oil that hydrates and casts a dewy glow from head to toe. It is suitable for most of the skin types including sensitive skins. It is the best solution for dryness, redness, dullness, and uneven texture of skin. Coconut Melt is comprised of 100 percent pure, organic, and unrefined coconut oil that melts on contact to provide rich hydration from head to toe. Ideal for all hair and skin types, including dry skin, eczema-prone skin, and chemically-treated hair, this lavish oil is loaded with fatty acids to seal in moisture and lauric acid to combat inflammation. This can be used as a Makeup remover, Lip balm, Deepest conditioning hair mask, Bath boost, Super shave oil, Massage oil, Belly beauty balm, and Baby butter. I melt a dollop in my hands by rubbing the palms together to warm up the oil, I do follow the traditional Indian way to keep the jar in hot water and it melts so nicely. Then I lather it generously all over the body as a moisturizer. Apart from that, I have used it to remove my makeup, it works great even for the waterproof makeup, coconut melt on the scars is an old remedy and it works, pre-shampoo treatment for hair, even on my kid’s dry winter skin for massaging and as a moisturizer for the body. It has come as a winner in all the ways I have used it till now. It melts when the temperature is high and solidifies again into the white soft texture when the temperature is low. 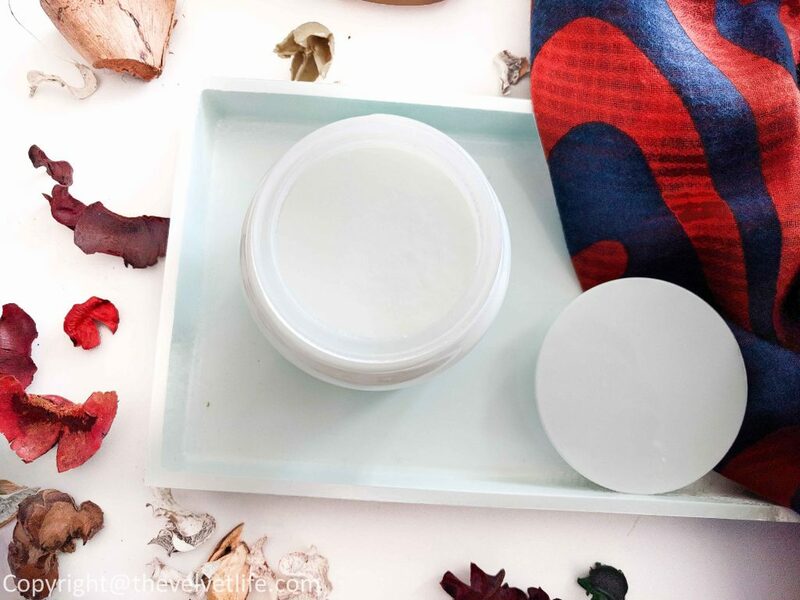 Overall, both these products are great for anyone looking to combat the dry winter skin. As there is no residue and it hydrates the skin without any oiliness, it will be great to use year around. These both are keepers for me and I would love to repurchase them once these jars get over. 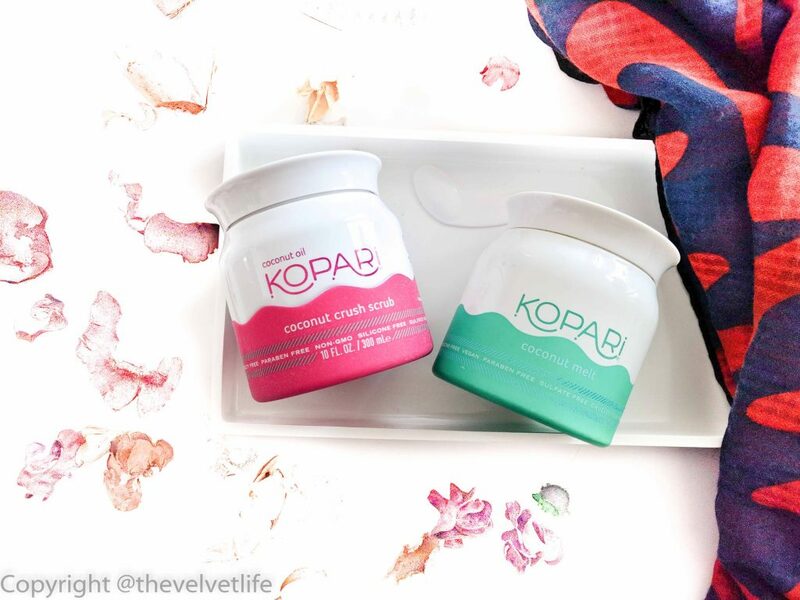 Kopari Coconut Crush Scrub and Kopari Coconut Melt are available in Sephora Canada. Fresh is brand based on the fusion of effective natural ingredients, time-honored rituals, and modern science which offers a sensorial experience with great results. In my Holiday Gift ideas series, I recommended the Cle de Peau Beaute Essential Radiance Set in the post linked here, I have more recommendations for skincare and body care gift sets in this post. Fresh Hand Creams are already a part of my body care routine and they are amazing, I had a post about them linked here. I have used Fresh products here and there both in my face and body care routine, this is a good brand if you are looking for natural ingredients that give results. 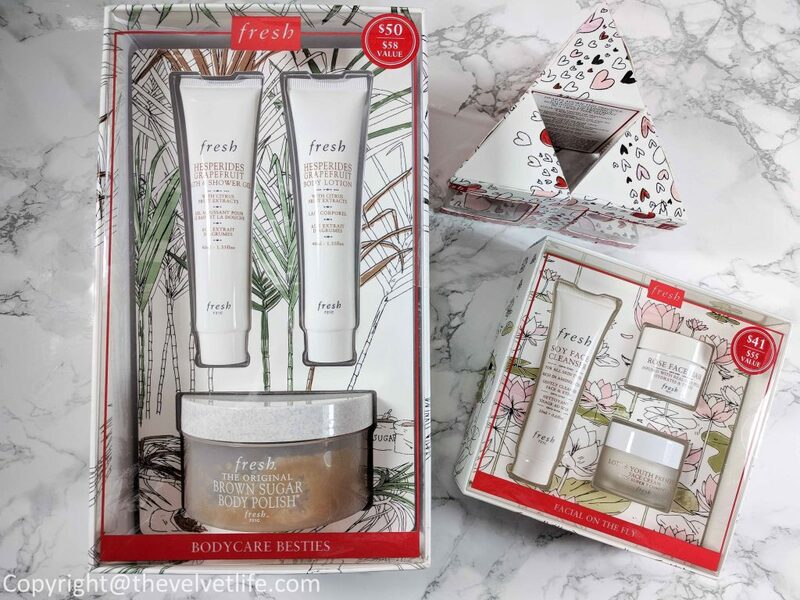 I have three gift set recommendations from Fresh Holiday 2017 gift sets, namely, Fresh Facial on the Fly, Fresh Bodycare Besties, and Pretty in Pink Lip Gift. 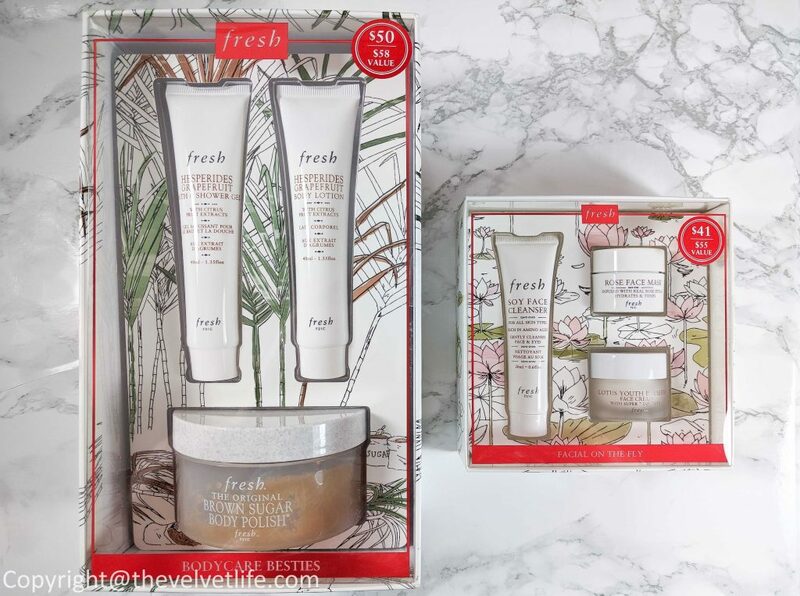 Fresh Facial on the Fly set is described as a must-have skincare gift set by Sephora featuring Fresh’s best selling products that help keep the skin supple, and radiant on the go. The products in this set are suitable for all skin types including sensitive. The set consists of Soy Face Cleanser (20ml), Rose Face Mask (15ml), and Lotus Youth Preserve Face Cream with Super 7 Complex (15ml). Cleanse, mask, and moisturize on the go with this must-have skincare gift set decorated with lotus flowers to highlight Fresh’s radiance-boosting Lotus Youth Preserve Face Cream. The ritual gently cleanses while soothing and hydrating the skin, making it ideal for everyday use—wherever life takes you. Soy Face Cleanser is a bestselling, do-it-all gel cleanser for all skin types that gently removes makeup—even mascara—and dirt without drying the skin. Rose Face Mask is a cult-favorite hydrating gel mask infused with real rose petals and soothing rosewater that tones the complexion. 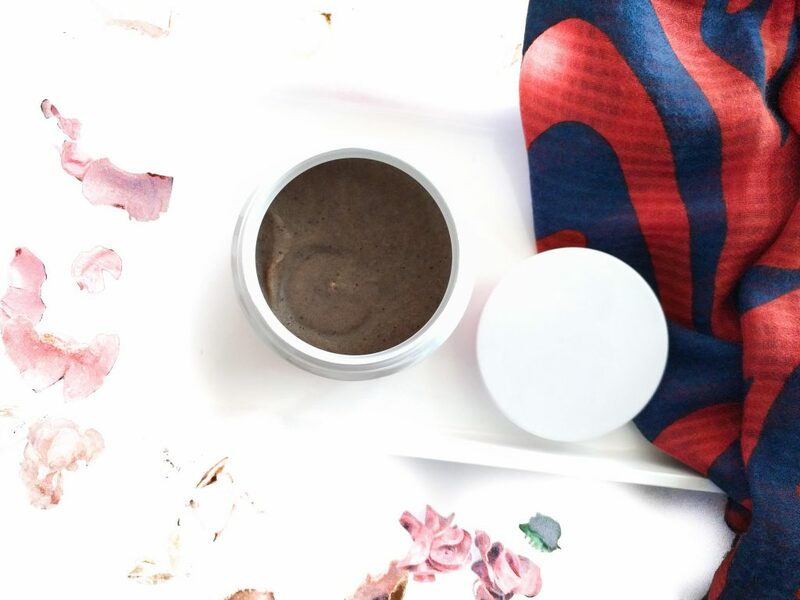 Lotus Youth Preserve Face Cream with Super 7 Complex is a lightweight daily moisturizer that provides up to 24 hours of significant moisture and diminishes visible signs of aging while supporting a radiant appearance and prepping skin for makeup. 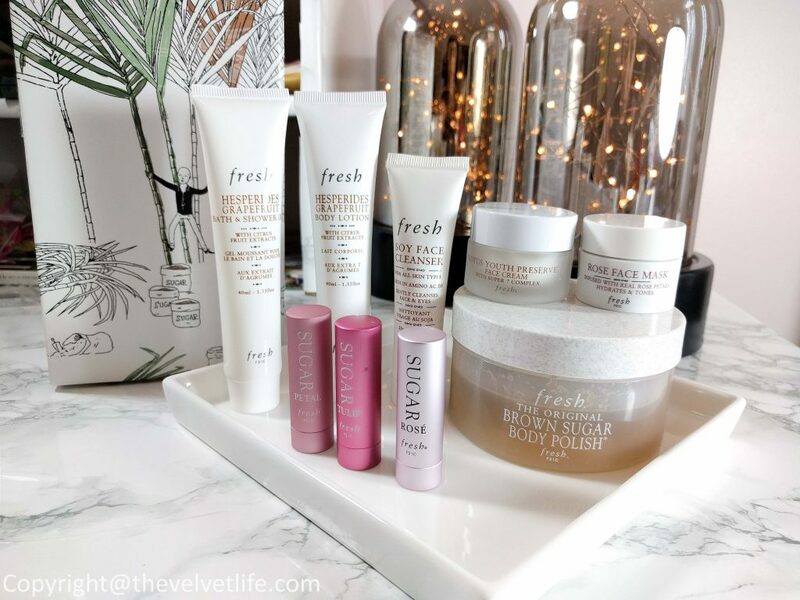 Fresh Bodycare Besties is a giftable body care collection that cleanses, exfoliates, and hydrates for soft, smooth skin all over. The set consists of Hesperides Grapefruit Bath & Shower Gel (40ml), Hesperides Grapefruit Body Lotion (40ml), and Brown Sugar Body Polish (200g). The products are suitable for all skin types including sensitive. The set has the nourishing trio featuring cleansing, exfoliating, and moisturizing essentials for soft, smooth skin all over. The sweet sugar cane design celebrates sugar, a natural exfoliant for the skin, while the Hesperides grapefruit duo refreshes your senses with an intoxicating citrus medley. 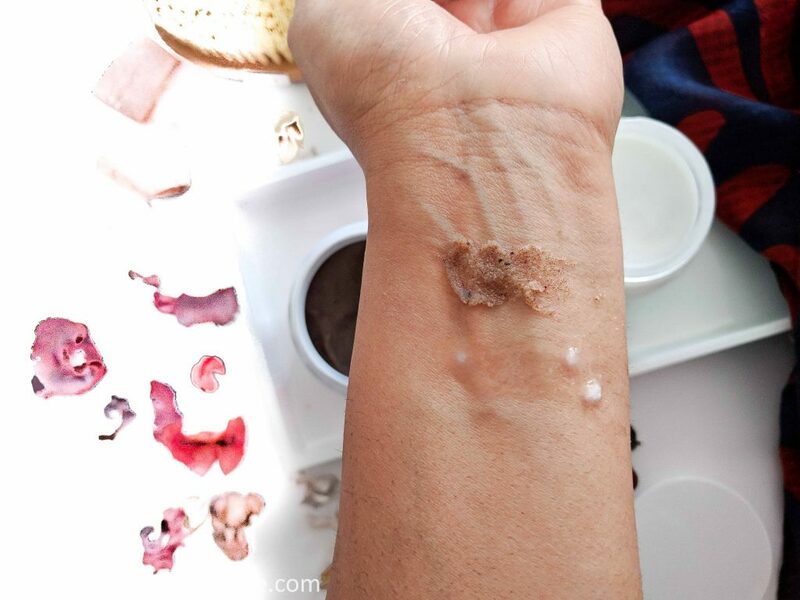 Brown Sugar Body Polish is the original, natural sugar exfoliant that combines real brown sugar crystals with precious oils to remove dry areas for soft, nourished, and radiant skin year-round. Hesperides Grapefruit Bath & Shower Gel is a refreshing formula that gently cleanses with nourishing shea butter and vitamins C and E while leaving a bouquet of citrus notes, such as Italian lemon, mandarin, grapefruit, and bergamot. Hesperides Grapefruit Body Lotion is a nourishing body lotion best paired with Hesperides Grapefruit Bath & Shower Gel that moisturizes for up to 24 hours with an intoxicating citrus scent. Pretty in Pink Lip Gift is a set of lip treatments to nourish, protect, and smooth lips in three shades of pink that can be given as a trio or separated and shared. The set consists of three 2.2g Tinted Lip Treatment in Sugar Rosé (a sheer rosy tint), Sugar Petal (a bold pink blossom tint), Sugar Tulip (a sheer hot pink tint). 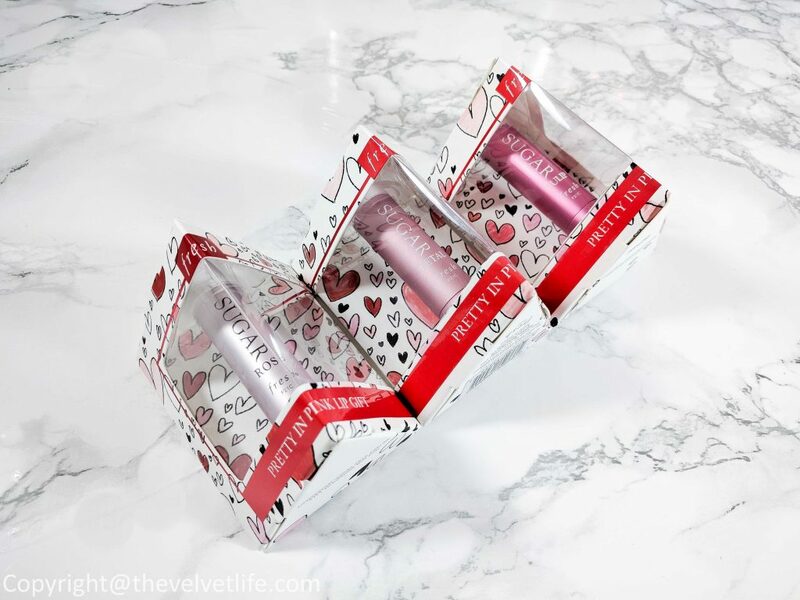 The precious package with hearts adorned on it contains nourishing lip treatments in sweet pink tints that complement all skin tones and are perfect for everyday use. Gift as a trio, or easily separate along the perforation and give the perfect shade to the person you love. Delivering long-lasting hydration, the Sugar Lip Treatments nourish, protect, and smooth the lips with a blend of moisture-preserving sugar, meadowfoam seed oil, and black currant seed oil. The lip treatments also provide sheer coverage or buildable color. Fresh Facial on the Fly, Fresh Bodycare Besties, and Pretty in Pink Lip Gift are available at Sephora Canada. They are great for gifting the loved ones and to gift yourself. Also, it is a great way to try the products from Fresh if you have not done yet. Givenchy is one of my favorite brands, be it the formula, the shades, the range of products, and the packaging, I am a fan of everything from this house. 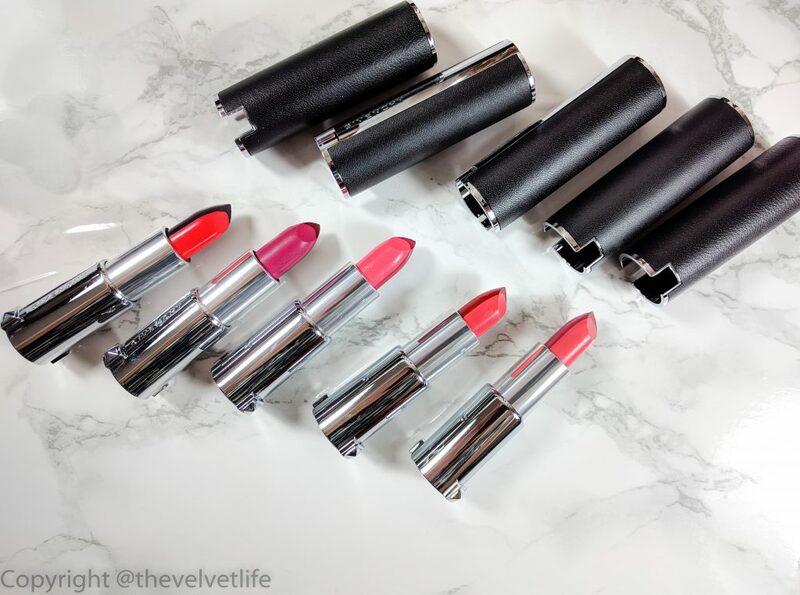 Givenchy Le Rouge Sculpt Lipstick is a long time love since I reviewed it on the blog a few months back, here is the link to all the products in Givenchy L’Autre Noir 2017 Autumn-Winter Collection. The lipstick is a must-have if you are looking for hydrated, plump, and beautiful lips. 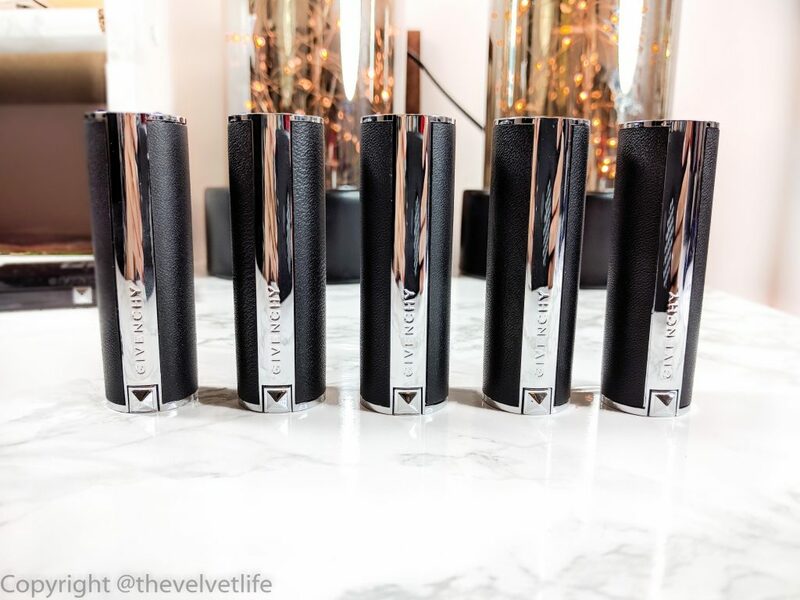 The must-have Le Rouge Sculpt Lipstick which is Givenchy’s first two-toned lipstick and it offers color and contour on a single stick. The key points include: it restructures the lips with a single stroke, its sculpting volume enhancing effects reshape the smile. The lips are adorned with a luminous shade, while the darker graphic contour perfectly reshapes the mouth. This comes in five color combinations, each featuring a vibrant inset shade highlighted by its own structuring shadow. This contour shade of the lipstick is enriched with a revealing black made from eosin to bring out the inset. 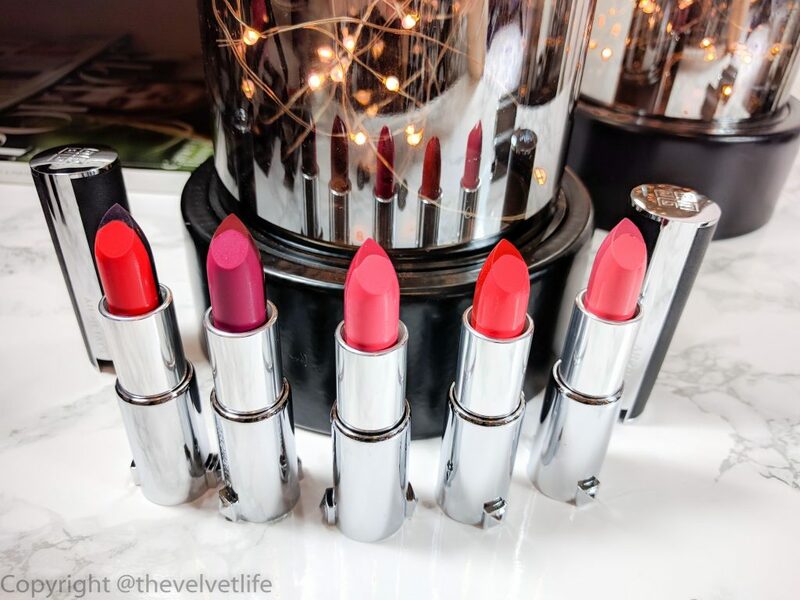 This lipstick has all the qualities of the Le Rouge range. It has a creamy texture for a comfortable semi-matte finish, with very concentrated pigments to ensure maximum coverage. It does include beeswax and Hyaluronic acid to build up the volume and moisturize the lips. The fragrance in this lipstick is the same as the original Le Rouge. 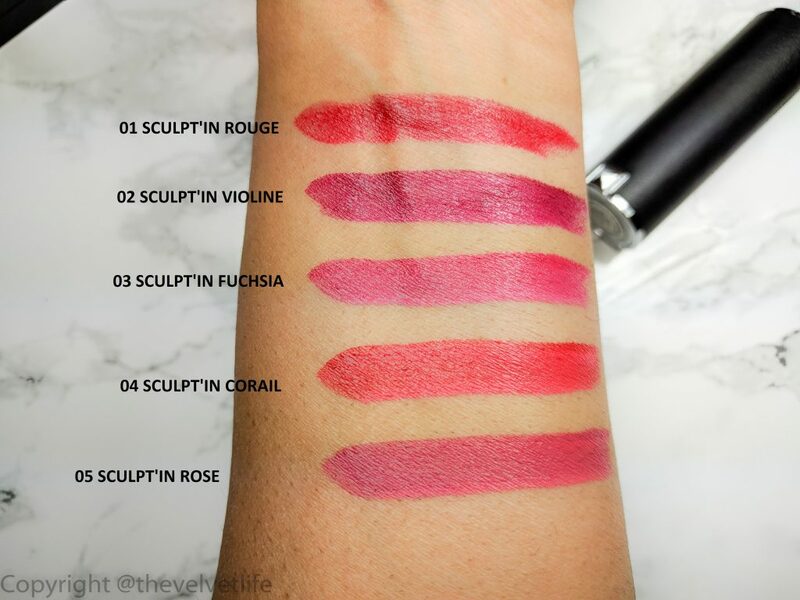 The shades available are No 1 Sculpt’in Rouge, No 2 Sculpt’in Violine, No 3 Sculpt’in Fuchsia, No 4 Sculpt’in Corail, No 5 Sculpt’in Rose. When I first saw this lipstick, I thought how these two colors will work and look on the lips, and when I used this, they look so beautiful on the lips. They mix up really well on the lips. The outer contour shades define the mouth and the inner red shade gives the color. The result is a really beautiful amalgamation of the two shades giving me a nice color and moisturized plump lips. I would say this works very well if you don’t even use a lip liner. By two or more applications, more intense color can be achieved. Also, if I am not looking for the contour and color defined separately, I would just apply this lipstick and rub my lips together to have the color and the pumping effects of eosin on the full lips. The shades in all the bullets are chosen and coordinated so beautifully that they give the most beautiful look when applied. From the swatch of the lipstick, you can see it looks like a normal lipstick because I have used it the way I normally apply these but if you see in the post I linked above, the swatch shows the brown shade separate from the colored shade. The below swatches show the shade that is the finish when the contour and the inner shade is mixed. 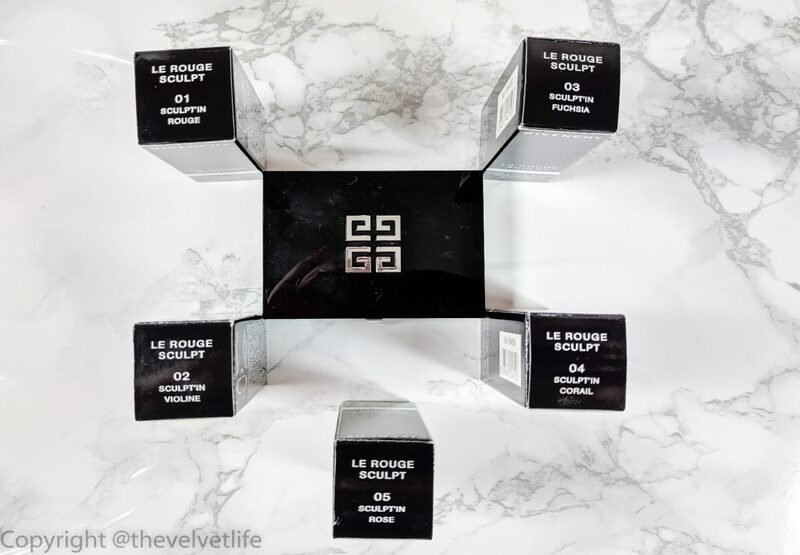 Givenchy Le Rouge Sculpt has limited edition lipstick as mentioned earlier and is still available online at Sephora, Net-A-Porter, and Saks Fifth Avenue. So if you want to indulge in this luxurious beauty, I would recommend you to check it now before it is sold out.